Found A Fiddle Repaired by A.M. Batchelder. Glorious! Every now and again,I wander the used fiddle section of Ebay,and usually looking is all I do. However,I stumbled (or was rather guided) to one listing in. 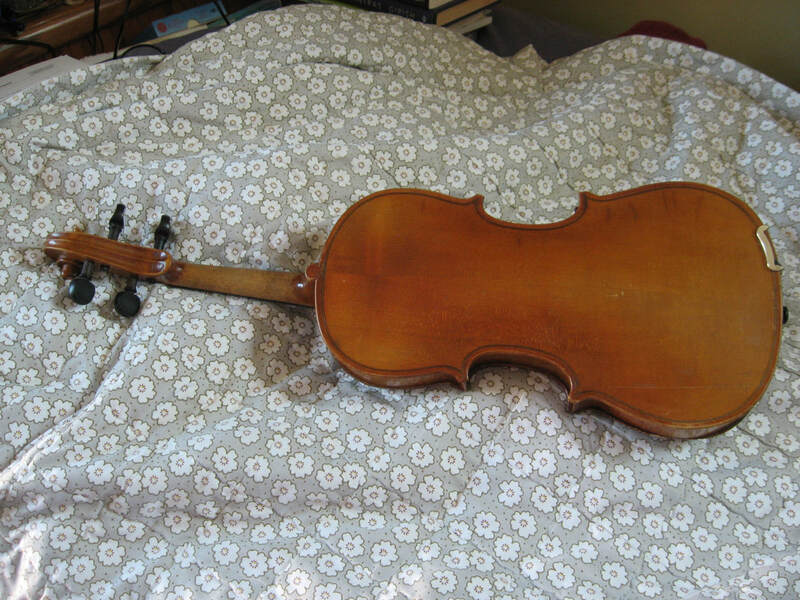 "Antique fiddle" it said,with a repair tag inside that stated,(according to the seller) that it was repaired by an A.M. Batchelet". So I opened another window on my computer out of curiousity,and looked the name up. Turns out the seller didn't do their homework,and also mis-spelled the name. I found,thankfully,a whole website dedicated to Batchelder violins, who were a father passed on to son violin making team. 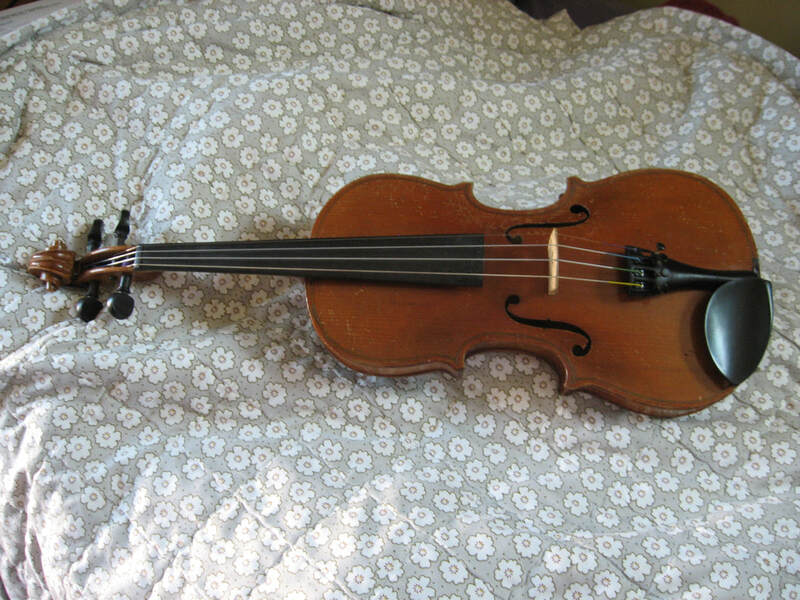 Starting the the late 19th century the father,Edwin,taught his son,A.M., violin making at a tender age. A.M.,passed on in 1968. He built and repaired violins. They worked out of Maine. I did ask the seller about how old the fiddle was,to which I got an "I don't know" as a response,which was rather odd as the seller had a lot of used fiddles listed,many that were in the hundreds of dollars range. I got this one as a BIN for under $60. It's a 3/4 size,which is the right size for me. I tuned it up after humidifying it briefly,and this fiddle plays like a dream. So easy,lots of volume and a good tone. I want to take it to a qualified fiddle store to find if this was built or simply repaired by A.M. It's a very basic built fiddle as far as looks go. No rich expensive looking wood on this one,but the tone and the playability are absolutely wonderful. I really wish a previous owner hadn't replaced the tail piece. That's my only complaint about it. I would love to get an idea as to how old it is as well. There is a repaired crack on the backside on the lower bout....looks to have been a heat crack from what I can tell,but am uncertain on that. It's Official: I'm a Fiddle Teacher/Coach! Well yesterday was the day I started officially teaching fiddle. And I'm grateful. 2017 was a hell of a year of personal initiation as there were a couple of huge changes,events that meant my life would never be the same again. So I'm very thankful that so far in 2018,while I'm still working thru some non musical stuff, I'm now able to pursue teaching as I've wanted to do for a couple of years now. I'm presently teaching Carter style guitar,too,and the used Oscar Schmidt I picked up in 3/4 size is wonderful. A beautiful blue,it's a joy to play. 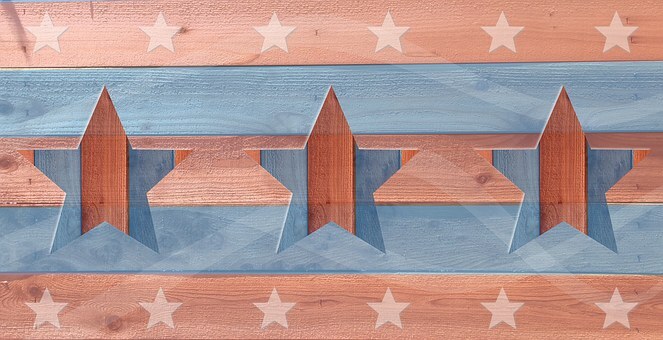 Unbelievable that the 4th of July is nearly here! Where did the year go? Good grief it's nearly time to start working on carols,and plotting out the 1st Halloween I'll be celebrating in many many years,complete with a jack o lantern on the porch. Looking at what tunes would be suitable for Halloween. And also on tap is I'm getting back to making fiddle accessories (fiddle blankets,rosin puches,and wipe down cloths) as well as instrument straps that work for banjo,guitar,mandolin,ukulele (providing it's got a strap button at the bottom) and Appalachian dulcimer. Wishing you all a very safe,sane,and happy 4th! arranger with a quick wit and a passion for studying how music plays a role in healing.